Sign up and receive Property Email Alerts of Duplexes for sale in Three Anchor Bay, Atlantic Seaboard. 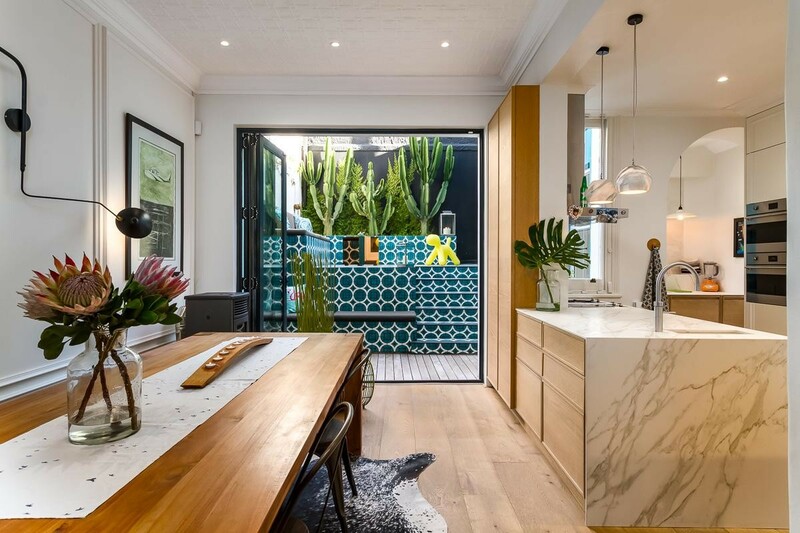 This magnificent duplex home has been tastefully redesigned by South African based interior Designer E.Hanekom. The front garden patio offers a warm welcoming entrance to this modern Victorian home. The ground floor consists of the lounge, dining kitchen, guest restroom, outdoor patio and separate laundry area. The design features offers 3,1m high Pressed Ceilings, victorian fireplace, built in Italian pellet stove, wire brushed oak floors with star oak patterned floor landings, indoor and outdoor living separated by double glazed floor to ceiling stacking doors to tiled patio (Moroccan hand painted tiles) with designer outdoor shower. The minimalist kitchen, designed with purpose and functionality, includes SMEG integrated appliances and sliding cupboard doors that conceal countertops and storage spaces. Separate scullery area with two dishwashers. It even has a cool tap called 'Quooker', for instant filtered cold water and hot boiling water. The second level is accessed via the refinished Victorian staircase. This is the private spaces of the home and consists of two bedrooms, a playroom and two bathrooms. The Master has been cleverly been designed with storage behind the head board wall, drawers underneath the bed and a closet with sliding cupboards. The bedroom is also ensuite and has a small balcony. The second bedroom is also large and has another room adjacent currently used as a playroom/TV/Study. Built-in cupboards and beds in bedrooms. American shutters in Bedrooms and Lounge. Internet WIFI uncapped & unshaped. Sign-up and receive Property Email Alerts of Duplexes for sale in Three Anchor Bay, Atlantic Seaboard.